Going through bankruptcy is a very stressful and time-consuming situation. We at The Weller Legal Group are your helping hand in making the bankruptcy process easier and more efficient for you and your family. In this article we are going to discuss a popular question that many clients have, and that is what are the roles of a Chapter 13 bankruptcy trustee. Chapter 13 bankruptcy is a type of bankruptcy where the court determines a debtor’s disposable income and uses this to decide on an amount to be used towards debt repayment. A Chapter 13 bankruptcy debt repayment plan usually can last anywhere from 3 to 5 years. During the repayment plan the debtor is not allowed to take out any more significant debt without the approval of the court. After the payment plan all remaining dischargeable debts will be discharged by the debtor. The trustee must be able to analyze and authenticate information that is pertaining to the filer’s bankruptcy case. They must be able to verify your initial bankruptcy filing, petition, schedules, and statements. The trustee may request to see your financial documentations to confirm that they support the information that you have provided in your bankruptcy papers, they will require you to provide your tax returns and any other evidence of income. Be prepared to answer any questions that your trustee may ask you throughout your Chapter 13 bankruptcy case. The trustee must be able to spot any evidence of fraud or deceit in regards to your bankruptcy filings. If they discover such evidence they are required by law to report this to the court. Be aware that any abusive filings could be enough reason for the court to dismiss your bankruptcy case completely. The trustee in your bankruptcy case may be able to help you recoup your assets that you transferred to others before filing your bankruptcy case. The trustee must object to the confirmation of your plan if it does not meet the qualifications of bankruptcy law or if it does not appear to be feasible under your financial situation. The trustee must make sure that you are reporting all of your income, which creditors will receive at least the same amount as if you were to file a Chapter 7, and that you are in a position to pay them back under the proposed plan. The trustee in your Chapter 13 bankruptcy case must collect your plan’s payments and disburse the funds to your creditors. The trustee must make sure that they collect the proper amounts each time and that there is no discrepancy in the amounts received. Be aware if your financial situation changes during the length of your plan, the amount of your plan payments may also increase or decrease, depending upon the situation. The trustee for your case must make your information available to creditors and any other interested parties that are associated with your bankruptcy case. They must respond to creditor’s requests by providing your detailed information for them to analyze. The trustee must report to the court when you have successfully completed your payment plan, which will make you eligible for your discharge. If the trustee in your bankruptcy case suspects you of participating in criminal activities then they must report you to the Department of Justice. The trustee is also tasked to take the steps to detect and prevent any fraud by creditors or other parties involved with the bankruptcy case. The trustee in your Chapter 13 bankruptcy case can give you financial advice. They can also help you with setting a realistic budget that will assist you throughout this difficult time. This budget will aid you with fulfilling your payment plan and still being able to take care of your necessities. If for whatever reason you experience hardship, you may be able to modify your plan depending on your situation. During the process of valuing all of your assets, the trustee may even be able to hire an appraiser for you to assist in determining the value of your items. This can assist in coming up with a reasonable plan and make sure that you are treated fairly in your bankruptcy case. The bankruptcy trustee will attend the confirmation hearing and discuss with the judge whether he or she believes the payment plan is reasonable for you to make. The judge will then have to decide whether to approve or reject the proposed plan. Even though one may believe that a bankruptcy trustee is in some sort of position of power they are not allowed to provide you with legal advice. Do not get legal advice and financial advice mixed up. If your trustee is providing you with legal advice this is not allowed and is against the law. Be aware that trustees can provide financial advice to you but not legal advice. Be aware that trustees are allowed to collect authorized payments for their creditors but they are not allowed to solicit you for additional payments or gifts. If your trustee is trying to get you to pay them additional fees or give gifts for special treatment make sure to report this immediately. A Chapter 13 bankruptcy trustee is not allowed to advertise or take actions to push you towards filing bankruptcy. You must be ready and willing to take this action because of your own will not because you are feeling pressured by the trustee to do so. The bankruptcy trustee is not allowed to employ any relatives to work for them in the same region that they are conducting their bankruptcy trustee work. This act is prohibited for bankruptcy trustees to do while they are working with these bankruptcy cases. HOW DO CHAPTER 13 BANKRUPTCY TRUSTEES GET PAID? The bankruptcy trustee is paid a percentage of the payments that they disburse to the creditors. This payment can usually range anywhere from 7% to 10% of the amount collected from the debtor to be paid to the creditor. 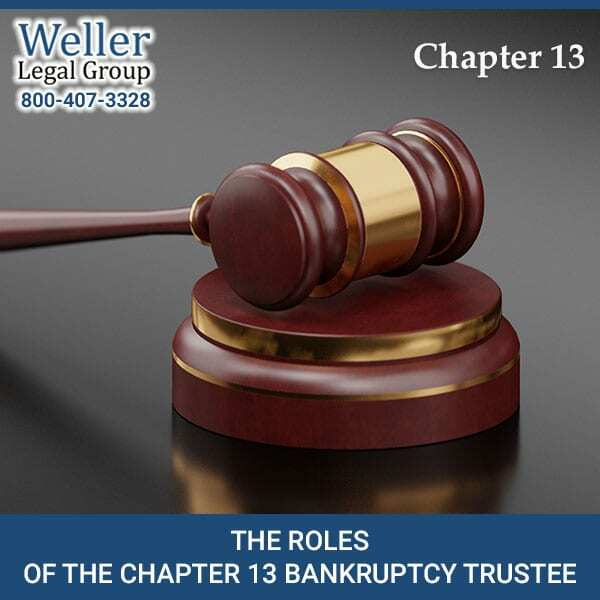 We at The Weller Legal Group hope that the information provided in this article helped you understand the roles of the Chapter 13 bankruptcy trustee. We primarily practice bankruptcy law and represent only debtors. We have offices located throughout Florida, including, Clearwater, Port Richey, and Lakeland. If you have any other questions in regards to bankruptcy feel free to give us a call today at 1-800-407-3328. Larry Bittner is a retired attorney / administrative professional who lives in Seminole, FL. He holds an A.S. degree in Business Administration / Accounting from Northern Virginia Community College, Annandale, VA, a B.S. degree in Political Science from California State University East Bay, Hayward, CA, and a J.D. degree from Golden Gate University School of Law, San Francisco, CA. He graduated from Law School in 1979 and was a member of the State Bar of California. from 1980 to 2015. In 1982, Bittner and Paul van Dyk established the Law Offices of Bittner & van Dyk in San Francisco. The firm operated as a general civil practice focused on Plaintiff personal injury, family law, probate, business law and related areas. Bittner sold his interest in the firm in 1989 when he accepted the position of General Legal Counsel to, and General Manager of the San Francisco restaurant Castagnola’s on the Wharf. In his subsequent career, Bittner held positions in both the private and public employment sectors, at various periods working as a Senior Legal Clerk / Court Supervisor with the Superior Court of California, County of Marin in San Rafael, CA; Executive Assistant to the Vice President / COO of a major CA custom hospitality furniture manufacturer in San Francisco, CA; Town Clerk, Town of Redington Beach, FL; and Administrative Staff Attorney with United States District Courts in Memphis, TN and San Francisco, CA. Bittner retired from the Administrative Office of the U.S. Courts in April, 2012. He lives with his partner Michael and their pet Doberman, Maeby, in Seminole.